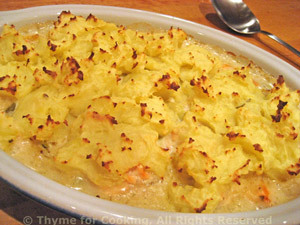 Fish Pie, with Salmon, Smoked Salmon, Savoy Cabbage, Thyme for Cooking. Add butter, horseradish and 2 tbs milk. Mash well. They should not be stiff but should hold their shape. Add a bit more milk if needed. Put fresh salmon in a medium skillet. Add water to almost cover, lemon juice, bay leaf and peppercorns. Cover and poach until done, 12 - 15 minutes. It should turn opaque and flake easily with a fork. Remove and cut into large chunks. Roughly chop the smoked salmon. Heat oil in a large skillet. Add onion and sauté 5 minutes, until it turns translucent. Add cabbage and sauté, stirring 2 - 3 minutes. Add white wine, chicken stock, herbs, cover and simmer 10 minutes. Uncover cabbage, increase heat and add cornstarch, stirring until thickened. Remove from heat, add yogurt and stir well to combine. 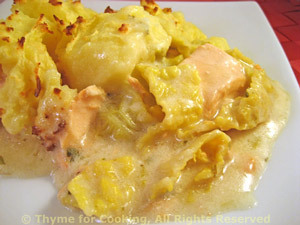 Add both salmons to cabbage and stir gently. Spoon into a baking dish large enough to hold everything. Bake, 400F (200C) for 15 minutes or until the top starts to brown. Remove and serve.